Daniel François Esprit Auber - composer with a considerable impact on the 19th century French opera and his work La muette de Portici (The Dumb Girl of Portici) - with which he had the greatest success, will be the subject of the second Summer Collection programme. There is a time for each gesture, experience and thought; and before these materialize, the time of the gesture, experience and thought, cannot exist without a firmly declared purpose. 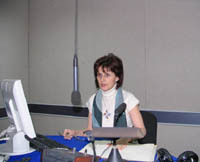 A radio program which until 1995 used to broadcast operas in the Radio Record Library was transformed by Luminita Arvunescu into a successful show which promoted contemporary international works performed at the time across the globe. For all this it received in 1998 the Musical Critics Union Award and in 2008 the Musica viva Award given by the Romanian Music Forum, but what was most important was that it gained the appreciation of all artists and opera enthusiasts – because the program offered them exactly what they lacked: the possibility to tap into the international opera scene at any given time. A wonderful opportunity for Luminita Arvunescu and her guests - performers, conductors, stage managers, scenographers and musical critics - to discuss the uniqueness of some truly remarkable moments in opera history by retrieving the hidden treasures of the recorder tape but also of the human mind, often configuring careers reenacted live from behind the microphone by artists such as Ludovic Spiess, Nicolae Herlea, Maria Slatinaru-Nistor, Dan Iordachescu, Mariana Nicolesco, Ionel Voineag, Felicia Filip, Leontina Vaduva, Ruxandra Donose, Anda Louise-Bogza, etc. A program which has archived up to this day dozens of interviews with great personalities such as: Placido Domingo, Maria Guleghina, Denyce Graves, James Levine, Thomas Hampson, Bryn Terfel, Renee Fleming, Ramon Vargas, Angela Gheorghiu and Roberto Alagna or with legends such as Luciano Pavarotti, Beverly Sills, Virginia Zeani and Ileana Cotrubas - all this being another argument for it to have a high rating. Saturday evening you can “collect” CD’s at first hand , a most agreeable get-together, hosted by Radio Romania Music and Radio Romania Culture. "We have rerouted An evening at the opera towards the live international satellite broadcasts and recordings more than ten years ago because I was feeling the need to browse the sheets not only in the classic artistic manner but also in the contemporary technical way. I wanted back then to be “in trend” with the world; and the fact that today, An evening at the opera has its own program of live broadcasts makes me feel very glad and is a constant motivating factor.